"Art Burn" was the seventh episode of the fifth season of the TV series Daria (episode number 507). It first aired on MTV on April 2, 2001. "Art Burn" was written by Dan Vebber. An accident with a smoke generator in Mystik Spiral's music video causes the collapse of the Lane family gazebo and 'traumatises' the band into taking a few weeks off. ("A few weeks off from what?") Daria and Jane comment off-handedly of it until Wind, visiting unexpectedly after another breakup, tearfully laments the disappearance of the 'Naming Gazebo' where their parents took them to decide names. Seeing his distress, Jane and Trent make a deal to have it rebuilt: she'll come up with the money and Trent has to organize and supervise its construction. Jane starts by trying to sell her paintings in the local park art fair, but has no success until one of her Van Gogh replicas is noticed by Gary, who hires her to produce copies of great artistic works for him to sell through his gallery. Elsewhere the Fashion Club decide to have their ensemble caricature done but are dismayed when the painting makes them look bad. They first try to have it destroyed but then have to buy so it remains unseen from the public. Later, in a meeting at Sandi’s, they decide (Stacy reluctantly) to hire Helen Morgendorffer to sue the artist. Trent hires a few workmen to build up a new gazebo, but the crew is happy to rest idle and invents excuses, indifferent to Trent's half-hearted requests to get on with the job - and Trent is left despondent when they call him "the man". Only when Jane prompts Trent to be more assertive do they start to work. Over the next few days, Gary is able to sell several of Jane's replica paintings. When she has saved enough money for the gazebo and wants to quit, Gary begs her to stay, praising her work and increasing her share of the profits. Jane reluctantly goes on painting for Gary but, as time goes on, she starts to burn out on painting and gets creative block, something that worries her. 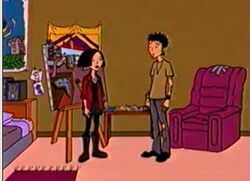 Talking with Daria later, she wonders whether Gary is running an art forgery ring and selling her paintings as originals. Despite her friend’s doubts, Jane convinces her to help check it and has Daria distract Gary as she goes through his records. The plan comes to naught when Gary offhandedly informs them that Steve Taylor is a client. Visiting the Taylor's home, they're greeted by Brittany and then Steve. Talking about her Van Gogh reproduction, Jane is stunned when Steve (not knowing she's the artist) calls one of her reproductions "hack" work that's merely "decent for the price", even pointing out some "lazy" brushwork in one place. Distraught at the talk - "even a cheeseball like Mr. Taylor could tell I'm a hack" - Jane definitely quits, admitting to Daria the job was really getting her down and that she was just looking for reasons to quit guilt-free. Back at the Lane’s, the gazebo work has not advanced anything by this time, thanks to Trent’s inability to order anyone to do work - "When I look in their eyes, I see... myself." Losing her patience, Jane forces Trent to work alongside the rest of the crew to finish the job, threatening not to pay them. So a few hours later the three youngsters hang around the finished gazebo. They’re surprised by the arrival of Amanda and Vincent Lane, who off-handedly propose taking it down. When Jane confronts them with Wind’s “Naming Gazebo” tale, they comment it was just a story they had invented when Wind had wanted to change his name and everything everyone's gone through was completely pointless. In the last scene, Quinn and Sandi lament the lack of possible legal actions against the painter and agree to have the picture burned. Unknown to the others, Stacy is keeping the painting hidden her room - as she's the only one he drew looking nice. This episode features an appearance by Wind Lane, Amanda Lane, and Vincent Lane: their first since "Lane Miserables". It turns out Wind once wanted to change his name to Ronald. Claire Defoe praises Jane's art as "among the most inspired and original" she'd seen at the park's art sale... then is unable to realise Jane deliberately painted a Van Gogh upside down, something Gary does notice. Mystik Spiral don't do cover songs. Ever. Jane and Trent have a brief spat over the idea of selling out, with Trent taking a hard line and Jane snapping back with (sic) "stay true to your art, I'm sure you'll always have the negative bank balance to prove it". While she'd made jokes about this before, she'd not previously been serious. The spat will reappear in Is It College Yet?, where Trent, panicking at the idea she'll leave, accuses her of selling out. When Steve asks "Brittany, why didn't you tell me you were having friends over? ", he gets told: "Oh, they aren't friends, just Daria and Jane." Ouch. This page was last edited on 17 April 2018, at 01:42.